Welcome to Team 2823’s Website! Team 2823, the Automatons, is a FIRST Robotics Competition team from Highland Park Senior High School in St. Paul, Minnesota. The team consists of students from Freshman to Seniors who are assisted by adult mentors. 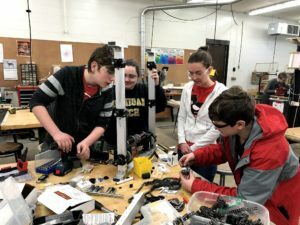 The team’s historic focus each year is to build a robot to compete in the FIRST Robotics Competitions held in the late winter and through early spring each year. Each year, at the beginning of January, FIRST announces the game challenge. For the next six weeks, known as build season, the team works frantically to build a robot that will meet that challenge. That period of work is intense, requiring many 12+ hour weeks, leading to the accurate description of ‘The Hardest Fun Ever’. The team competes in one or more 3 day competitions in late winter or early spring, and that is usually the end of the formal program. However, the rest of the year is very active as well. The team spends a great deal of time training and preparing for build season. 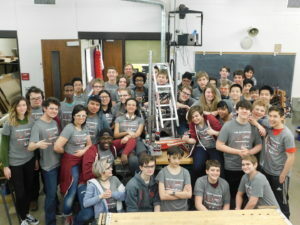 The team also performs a great deal of outreach; volunteering to showcase the robot at various activities around the Twin Cities (including elementary schools and the State Fair). Students are also expected to organize and run the enterprise, including the website, recruiting, and a range of other activities. There is no sign-up fee. We are partially funded by a generous grant by 3M, Thomson Reuters. However, that does not cover all of our costs, so there is fundraising throughout the year that students and their families are expected to participate in. We also ask families to volunteer to help with travel to special events and to help coordinate snacks during the outside of our regular season meetings along with meals during build season. The Robotics Team experience at Highland is an incredible opportunity; students get to work shoulder to shoulder with experts in their field. They get an incredible range of experience, from building, to software, to leading an organization. There are even generous scholarships that students can apply for. All in all, it is a fantastic experience for the students. We hope you come join us!